Did God Send the Tornado? 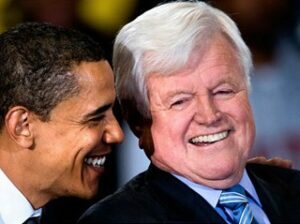 Listening to Obama gush all over Kennedy in a eulogy today disgusted me. He never mentioned the millions of babies that die because of Kennedy’s votes, his drunken womanizing, nor the drowning and subsequent silence regarding Mary Jo Kopechne at Chappaquiddick. It is a dangerous thing to fall into the hands of an angry God. I hope he repented before his death. May God have mercy on his soul. In 1971 Ted Kennedy said, “When history looks back to this era it should recognize this generation as one which cared about human beings enough to halt the practice of war, to provide a decent living for every family, and to fulfill its responsibility to its children from the very moment of conception.” How sad that he abandoned the truth and advocated of the lie.